Imagine your daily routine: you’re on the subway, walking down the street, going to the market, etc. 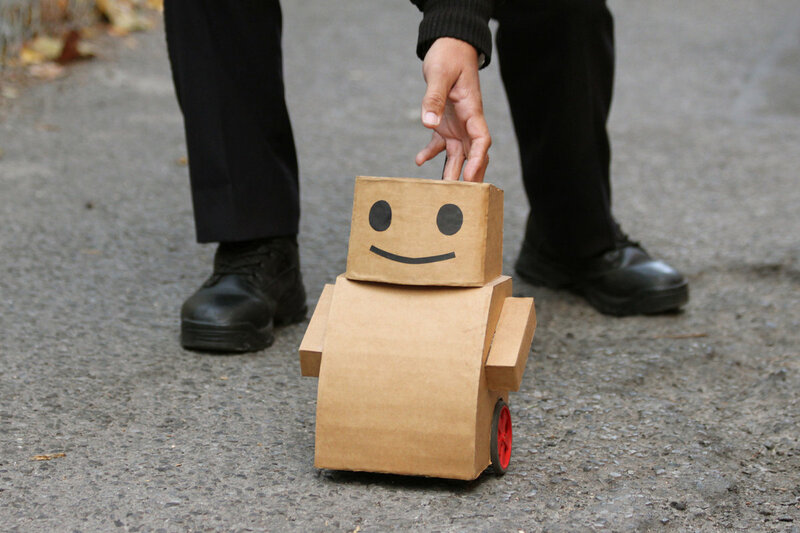 Now picture a small cardboard robot rolling by you with a flag taped to it asking you to help him reach his destination. What do you do? Do you walk on by or do you help him? Kacie Kinzer attempted to answer this question with her “Tweenbots”. It’s a fantastic social experiment that yielded some surprising results. More importantly it’s an affirming study in empathy and compassion and a nice counterpoint to this week’s headlines. This vid explains Kacie’s project- be sure to watch “Sam the Tweenbot” in action. The human reaction to him is priceless! “Tweenbot Tom” , made an appearance today in New York’s Museum of Modern Art where he asked patrons to steer him toward the “Talk To Me” Exhibit. This installation explores the dynamic of human interaction with objects. It’s an interesting convergence of art, design, science, technology, and sociology; Kacie Kinzer’s work is also featured here. FYI, with the help of some kind museum-goers, Tweenbot Tom successfully made it to his destination! For more information on MoMA’s “Talk to Me Exhibit”, click here. “Tweenbot” is thought provoking – struck me as a commentary on the digital age. We increasingly express our human side more and more through non-human means, social media, digital devices etc. Ponder–would humans act the same toward each other? Kinzler said it best in her presentation “Robots that make humans act more like humans”! “Talk to Me” is simply mesmerizing! I’m still processing it, but my experience is very positive. It’s digital communication at its best you can travel, escape, learn, be entertained just by a click. Loved the two together — Thank you Culture Shock! That’s such an interesting observation Ann! I agree, in this digital age it’s far easier to express ourselves through non-personal forms of socializing. I find the Talk to Me Site difficult to navigate, I’ll have to give it another shot!